After his inauguration in 1933, Franklin Delano Roosevelt took grave steps to help the nation recover from the Depression. Roosevelt's "New Deal" was an attempt to find jobs for millions of citizens using government-sponsored projects. The "New Deal" programs all seemed to have catchy abbreviations, like the NRA (National Recovery Act), the CCC (Civilian Conservation Corps), and the PWA (Public Works Administration). The goal of the National Recovery Act was to organize all industries into one giant effort. Codes of competition were created and industries agreed to certain practices recommended by Roosevelt's administration. Industries were also required to abide by new rules for maximum hours and minimum pay and to eliminate child labor. It was a voluntary program, and businesses that got on the bandwagon received a placard with a "blue eagle" on its face. 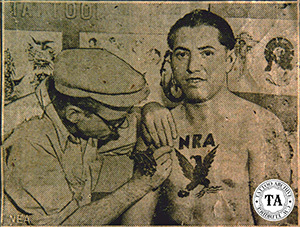 Above the eagle was the inscription "NRA", and below the phrase "We Do Our Part." The citizens of the country were encouraged to buy where the Blue Eagle was displayed. 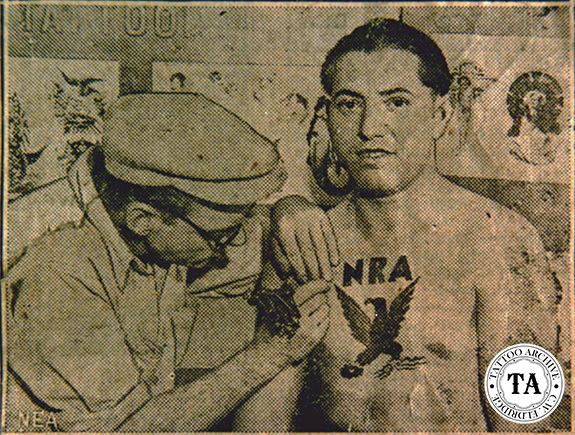 The "Blue Eagle" design was very popular and was often seen tattooed or painted on the bodies of patriots.